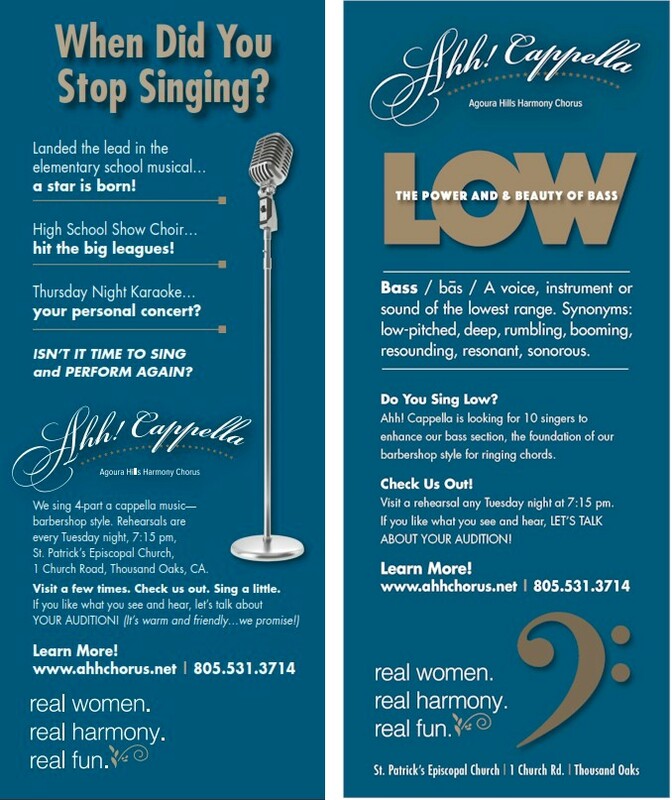 If you're a woman who loves to sing, we'd love to meet you! We have members from the Thousand Oaks, Westlake Village, Newbury Park, Simi Valley, Moorpark, Camarillo, and of course, Agoura Hills. We even have members who drive from Malibu and the San Fernando Valley! This is music for all women ~ from high soprano to low contralto / male tenor ranges ~ Barbershop harmony spans the entire vocal range. There are four parts represented. The tenor part is traditionally sung by women with a high, lyric soprano range. Unlike SATB or SSAA arrangements, the highest voice part in barbershop harmony does not carry the melody -- it is a harmony part, and so it must be sung lightly, with a lyric quality. The lead part is the melody line, and it is sung best by women with a mezzo soprano range. The next lowest harmony part is called baritone, and it is sung by either altos or mezzo-sopranos. Then, unique to the barbershop style, there is a bass part. Women with low voices -- women who sing men's tenor, men's baritone or have contralto ranges -- sing the bass part. Because the vocal range is so diverse, the style of music invites all women to join. There are no solo voices required, and in fact, the soloist will usually not blend with the other voices. Barbershop harmony is perfect for the average to above-average singer with a straight tone quality who longs for an ensemble role where she can sing, dance and perform. To quote one of our members, "It's the love of singing that brought me to AHH! Chorus. It's the enthusiasm, fun and lasting friendships that keep me returning week after week. I love it!" We rehearse at St. Patrick's Episcopal Church, 1 Church Drive, Thousand Oaks, CA on Tuesday nights 7:15 pm - 10:00 pm. Visitors are welcome, and we encourage you to drop by!